Easily grown in average, dry to medium moisture, well-drained soils in full sun. Provide some shade at the heat of the day for golden and variegated leaf forms. Does very well in gritty, sandy loams. Good heat and drought tolerance. Best to shear plants back regularly before flowering to keep the planting tidy and to induce growth of new leaves. Best propagated from cuttings taken from plants whose leaves have a proven superior aroma/taste (seed-grown plants sometimes have little aroma or flavor) when harvest of leaves for culinary purposes is desired. Leaves with good flavor may be clipped fresh as needed or dried for year-round use. Best leaf flavor usually occurs just prior to flowering. Origanum vulgare, commonly known as oregano, is a bushy, rhizomatous, woody-branched perennial which typically grows to 1-3’ tall and to 2’ wide on square stems clad with aromatic, glandular-spotted, rounded to ovate leaves (to 1 1/2” long) which are usually entire but sometimes have slightly toothed margins. Tiny, two-lipped, pinkish-purple or white flowers (typical mint family), each with 4 protruding stamens and leafy purple-toned bracts, bloom in axillary or terminal corymb-like spikelets which rise above the foliage in summer. Plants are native from Europe to central Asia, but have escaped gardens and naturalized in parts of the eastern and far western U.S. and Canada. Origanum vulgare plants are primarily sold in commerce today under a number of different cultivar, subspecies or varietal names, each geared toward a specific culinary and/or ornamental usage. Some plants produce leaves with great flavor/aroma (e.g., O. vulgare subsp. hirtum known as Greek oregano is the standard culinary spice rack oregano) but have little ornamental value. Other plants have great ornamental value in regard to having golden, variegated or curly leaves (e.g., O. vulgare ‘Aureum’ features golden yellow foliage) but little or no culinary value. The straight species is a robust but relatively common plant that is, as a general rule, seldom sold for a specific ornamental or culinary use. Flavorful leaves from certain O. vulgare cultivars, subspecies or varietal plants are commonly used, either fresh or dried, as culinary herbs for a variety of food dishes, particularly in tomato sauces used in Italian cuisine and pizza, but also in a number of additional applications including rice, soups, stews, dressings, vegetable dishes, egg dishes, dips and herbal vinegars. Leaf flavor can vary considerable depending on climate and growing conditions. The genus Origanum contains 45 species, 6 subspecies and 3 varieties. 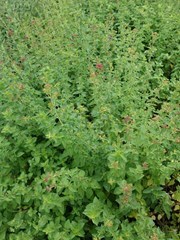 The common name of oregano describes a flavor as opposed to a specific botanical genus or species. Specific epithet is from the Latin vulgaris meaning common. No serious insect or disease problems. Root rot may occur in wet, poorly drained soils. Watch for fungal diseases. Aphids, leaf miners and spider mites may appear. Group or mass in herb gardens, border fronts, cottage gardens or rock gardens. Also effective as an edger or groundcover. Pots, window boxes, and containers. Cultivars with attractive foliage are used as ornamentals.